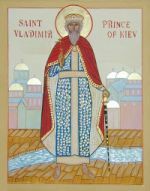 St. Vladimir’s was founded by a small group of English and Russian speaking individuals who wanted a parish which would be non-ethnic and open to all. The group finally decided that the Orthodox Church in America (OCA) was the most suitable jurisdiction for them. The OCA grew out of the Patriarchal Russian Church and was originally granted its independence by Patriarch Tikhon of Moscow at the time of the Russian Revolution. For a number of decades, there was uncertainty about the canonical status of the OCA, but its autocephaly was finally established once and for all in the 1970’s. Since then, the OCA has continued the tradition of Russian Orthodoxy, using both English and Slavonic in its services and adapting itself to the needs of each particular area. Although the OCA retains the Russian tradition of music and spirituality, it is also very much the Orthodox Church for contemporary North America. From 1996 onwards, our parish met in the domestic chapel in the home of Fr Vladimir in Halifax. Later we moved to the chapel of the Monastic Community of St Sergey of Radonezh. When the Monastic Community relocated to a rural setting, we moved to 5429 Cornwallis Street, into a church hall of St. George’s Anglican Round Church. After nine years, our landlords asked us to vacate the hall by February 2, 2013 due to extensive building renovations. We were blessed, however, with an opportunity to move info another former Anglican chruch, St.Phillip’s stone church on Purcell’s Cove Road. Please check our new location and driving directions. Our congregation consists of people of various backgrounds, and we try to be open to all. Visitors are always welcome, and the Orthodox Church extends its hand to all who are seeking a firm foundation of faith. The rector of our parish is the Rev. Dr. Vladimir M. Tobin. Fr Vladimir was born in 1942 in Halifax, Nova Scotia, and was attracted even during his teenage years to the Orthodox Church. Unfortunately at that time, there were no opportunities for non-ethnic Orthodox in this area, and he became a member of the Anglican Church and eventually an Anglican priest. However, his theological formation was very strongly influenced by Orthodoxy, and in due time the way was opened for him to become a member of the Orthodox Church and an Orthodox priest in 1993. He was tonsured as a hieromonk in Moscow in 2004. Fr Vladimir received his education in Halifax at Dalhousie University where he took a B.A. in Classics and an M.A. in Patristic Theology. From Pine Hill Divinity Hall he received a Master of Divinity. Later, he moved to Israel where he studied at the Hebrew University of Jerusalem and received his PhD in Egyptology. He taught at Saint Mary’s University in Halifax for many years where he established the first program in Egyptology east of Toronto. He authored several books and numerous articles on Egyptian myth, religion, literature and history and is a highly respected scholar in his field. He has studied a total of nineteen ancient and modern languages, among them Russian and Church Slavonic. He is still active to a certain extent in his academic interests and enjoys attending conferences and giving public lectures. Fr Vladimir finally retired from his secular job in 2005 and moved to New Germany, where he lives with his dog Seryozha in a large country farmhouse. He is also an accomplished musician and spends hours each week practicing on his Yamaha grand piano. When Fr Vladimir retired from teaching, he did not give up his involvement with the church. He still serves as pastor of the parish and commutes to the city for services each weekend. 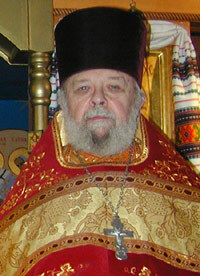 In May 2008, the Holy Synod of Bishops elevated Fr Vladimir to the rank of Igumen. Priest Alexander (Treiger) was born in St. Petersburg, Russia in 1975. It was in secondary school that he first discovered Orthodox Christianity. The desire to learn more about Orthodoxy and to embrace it inwardly grew stronger over the years. This dream came true in January 2001 in the Holy Land, when he received holy baptism in Jerusalem. In August 2001, he relocated to New Haven, CT to continue his studies. In 2008, he accepted a teaching position in Halifax and joined the parish of St. Vladimir. 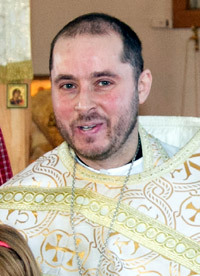 In January 2014 on the Feast of Theophany, His Eminence Archbishop Irénée (Rochon) of Ottawa and All Canada ordained him to the holy diaconate, and in January 2016, to the holy priesthood. Fr Alexander was educated in Jerusalem and at Yale. He holds a PhD in Arabic and Islamic Studies. Currently, he works as associate professor of Religious Studies at Dalhousie University in Halifax, teaching classes on the Abrahamic Religions. His main field of research is the history of the Orthodox Church in the Arab world. He has many publications in the field and is one of the editors of a new anthology of Arab Orthodox texts from the millennium 700–1700 in English translations. Fr Alexander is married to Ksenia. They are blessed with three children: Anna (born 2011), Alexey (born 2013), and Maria (born 2015). Only registered parish members have the right to vote during parish business meetings. To confirm your membership, please fill out the membership form. If you would like to become a member, please fill out pages 1 & 2. If you are simply renewing your membership, please fill out page 1 only. If you have changed your contact information recently, you may also want to fill out page 2. All information is kept confidential. Hard copies of the membership form are also available at Church. Baking prosphora is a very important and honourable ministry, we cannot celebrate the Eucharist without it! 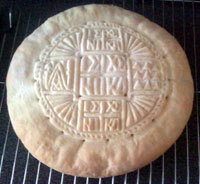 We presently have a registry of five bakers who provide fresh prosphora for one month at a time. Everything is done by hand. You do not need a mixer just some bowls and your hands. Prosphora does need to be delivered to the church early on Sunday morning (no later than 9:45am is best) but you can definitely bring it in on Saturday evening at vespers. Just let someone know it is there or better yet give it to someone in the alter or Fr Vladimir himself. We are in need of more people to bake prosphora. Any member of the church who is in good standing may bake prosphora. If you are interested in learning or already know how to bake it and can sign up for a one month rotation please do so. It is not complicated and there are several people in the parish who would be glad to teach you. Please see Luke or Juliana, or email to prosphora (at) halifaxorthodox (dot) org. Click here to read the recipe in PDF. Every Sunday, our parish has a coffee hour, consisting of a main hot dish, as well as some appetizers, salads, desserts — and, of course, fresh tea and coffee. Everyone is welcome to attend this communal meal, no matter whether you have some food to share or not! Now, eight families take turns in preparing the main dish. Other parishioners and visitors bring side dishes or desserts whenever they like. Supplies for coffee and tea are provided by the parish. For great feasts and events, we have potluck dinners instead of regular meals. This means that every family from our coffee hour committee should prepare the main dish only once in about two months. Many hands make light work! Please contact the committee at food (at) halifaxorthodox (dot) org if you are interested in cooking for the parish. As you know, Father Vladimir is getting older and cannot drive by himself from New Germany to Halifax for church services anymore. We are looking for volunteer drivers who would drive him to the church and back home so that he could continue serving our parish. Fr Vladimir already has arrangements to come to the city every last weekend of a month, and he is planning to take a Sunday or two off each month, meaning we need to arrange for his trips the remaining 1-2 times a month. Ideally, for each such weekend, one person should go to New Germany on Saturday, and another, on Sunday, so that we won’t overburden our drivers. With 6-8 people in charge, each person would only have to make one long trip every two months or so. From Fr Vladimir’s house in Pinehurst to the church for Saturday evening. It takes about 1.5 hours of driving one way. You should leave Halifax at 2:30pm, pick up Fr Vladimir around 4pm, and arrive to the church before 6pm for Vespers. If he has something scheduled before Vespers, the trip will be shifted 1-2 hours earlier. From the church to the place where Fr Vladimir stays at night (near Halifax Commons) after Vespers (7pm). From that place back to the church on Sunday morning: leaving Halifax Commons at 9:10am and arriving to the church by 9:30am. From the church back to his home in Pinehurst: leaving the church around 1:30pm and returning to Halifax by 3:30-4pm. The parish will offer a $25 gas card for every long trip to Pinehurst. Any help will be highly appreciated! Even if you can just give a ride in Halifax occasionally, it will help other drivers a lot! Alina Kirsanova will be in charge of collecting information from possible drivers and making a schedule for the trips. Please contact her at driving (at) halifaxorthodox (dot) org or by phone 902-830-7803 if you can give any rides to Fr Vladimir, either on a regular basis or just occasionally, or if you are already planning to make a trip towards Bridgewater at any given weekend. Thank you so very much for your contributions. We are a small community and every effort, big or small, is felt and appreciated!